Frequently Living earth is alsked to create 'bespoke mixes' that deliver on specified performance requirements for designers. This is a key part of our work with landscape architects, engineers and project managers. For instance, at Auckland's iconic Wynyard Quarter, raingarden media with a higher infiltration rate was specified to enable the garden beds to cope with heavy downpour occurring in a short space of time. 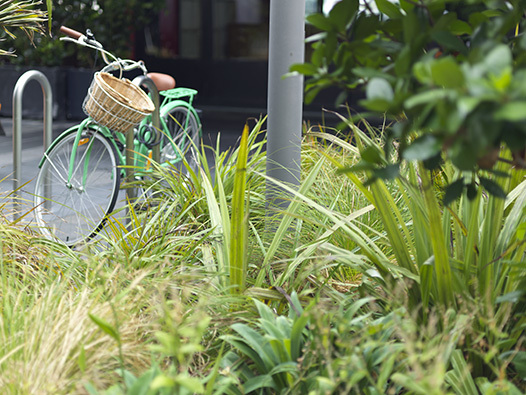 Living Earth worked with scientists, engineers, Waterfront Auckland and Hawkins Open Spaces to design the raingarden media required, then undertook testing with Landcare Research to measure performance. Now some areas are over six years old, with high conductivity rates and attractive NZ plants well established in the beds. This is a popular and unique area of Auckland City and Living Earth is pleased to be playing a part in its development.